Setting foot on Halong Bay, travelers have opportunity to experience mysterious feelings in a fairy world of rock caves. 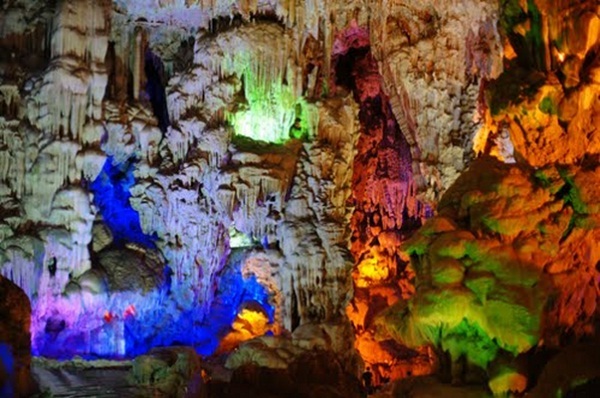 Hidden inside Halong Bay caves are magic mazes of stalactites and stalagmites in various sizes and shapes as magnificent masterpieces definitely dazzling all visitors coming here. Halong Bay is dotted with a lot of beautiful caves. Most of them are accessible only by boat but some can easily get by tour. 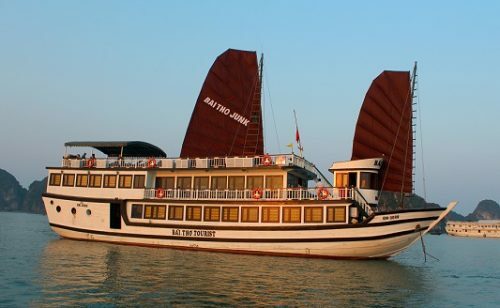 Among Halong Bay caves, the most worth visiting that travelers can not miss chances to explore are Surprising Cave (Sung Sot Cave), Drift Wood Cave (Dau Go Cave), Heaven Chamber Cave (Thien Cung Cave), Pelican Cave (Hang Bo Nau), etc. Let step your foot to inside of each cave and you find it extremely amazing. 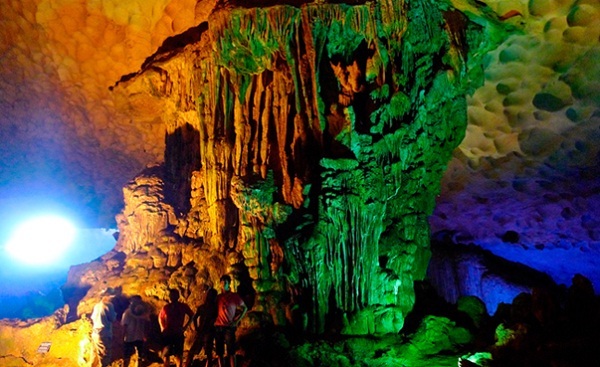 Located in the central zone of Halong Bay, Sung Sot cave is one of the largest and most beautiful caves here. With an area of 10,000 square meters, it contains different kind of rare rocks whose shapes are diversity and mysterious. Following the steep path under shady trees, visitors will reach the cave with two chambers separated by the 3m-wide path. The square outer chamber has the ceiling filled with fabulous stalactites while the inner one is quite large with capacity for thousands of people. 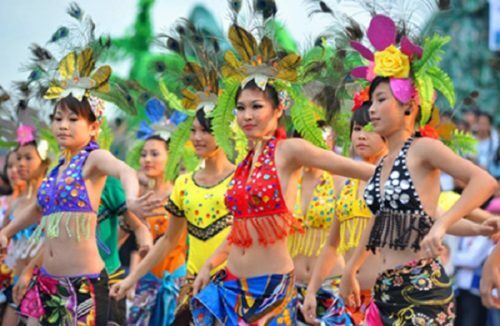 Of Halong caves, Sung Sot is the most popular cave to visit in Halong Bay. 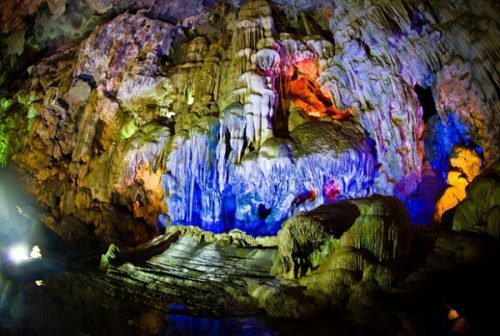 Thien Cung is also one of caves that worth a look among Ha Long Bay caves situated in Van Canh Island. The road to the grotto is perilous, covered on both sides by thick forest. With 130m in length, this cave is known as a magnificent palace created by abundant stalagmites. There are 4 pillars in the center fossilized in form of nature shapes such as fish, birds, flowers or even scenes of human life. All of which are created by hand of nature over million years. 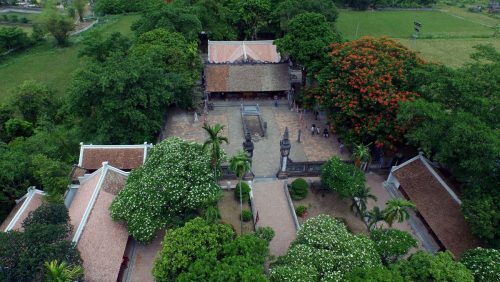 One more cave we cannot forget to miss when traveling Halong Bay is Dau Go Cave which lies on a limestone islet 8km south of Bai Chay. Exploring inside the cave, travelers can see its construction of two chambers. The first one has the most spectacular stalagmites and stalactites of its own shapes, mostly depending on the imagination of observers. On the other hand, the second chamber appears mysterious colors when its walls reflect the bright lights shone on them. Each cave has its own beauty and Halong caves really give travelers interesting exploration with mix of feelings.